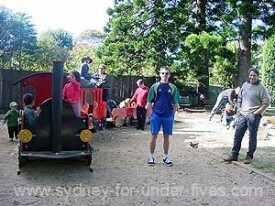 It was the search for the ideal fully fenced playground that set me off researching Sydney’s best places. I had a really wild, hyper boy-child who was a serial bolter. I could run faster than him for the first couple of years. Then I was pregnant with number two son and it became just too dangerous to go anywhere he could escape from. After that, the twin factor kept us safely inside fenced playgrounds. 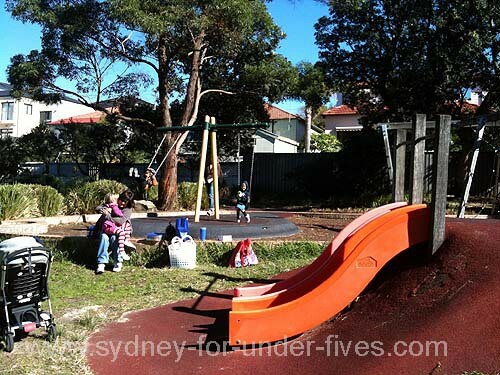 For all those mums, dads and carers of active boys, toddler-baby combinations, twins, triplets and quads and also kids with special needs, here’s my list of the best fenced playgrounds in Sydney’s north. 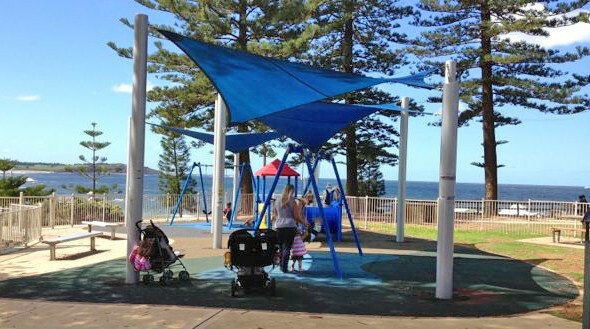 For Best Fenced Playgrounds in Sydney’s Eastern Suburbs click here. PS Click here to find fenced playgrounds in other areas of Sydney. Stanley Street, Chatswood; excellent equipment including a great train, right by an oval, good shade, fabby place for littler ones. Lofberg Road, West Pymble; superb new equipment, other play areas for older kids, grassy spaces, bike track outside, pool nearby. See our post on this website here. Birdwood Avenue, Collaroy; wonderful views and very large playrgound with excellent equipment, bike track, cafes quite near. 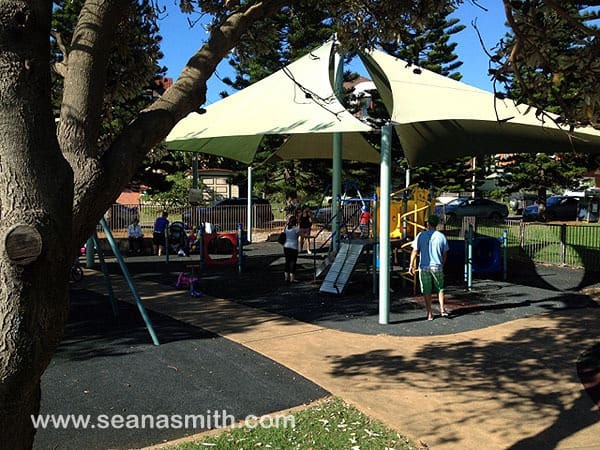 Collaroy Playground, soon to be updated but still terrific. On the reserve above the playground, excellent for younger kids. Read about the beach and playground here. One readers favourite, see comments below. Thank you! This is a lovely playground with great views and good equipment, but no toilet!! Part of John Roche playground, there’s a terrific sandpit there too. 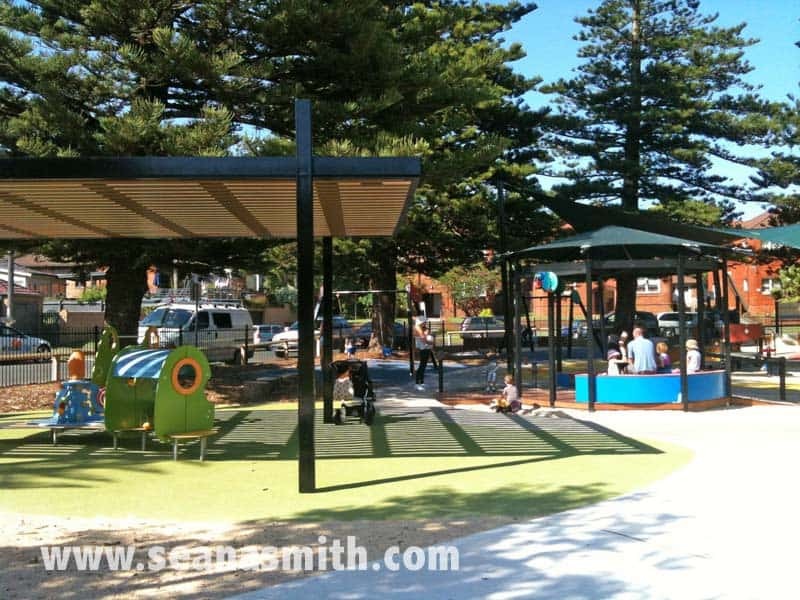 Cameron Avenue, Queenscliff; fab views, good play equipment and large size, cafes quite near, near to beach. Lagoon Park Playground Manly, main play area. Cnr Gouldsbury Street and The Crescent, Mosman; handy for shops and cafes, good size, top equipment, bike tracks inside play area. Campbell Parade, Manly Vale; very large fenced area, by ovals, bike track, dry creek area, fantastic bushy feel. A real hidden gem, with some lovely equipment and a bushy feel. 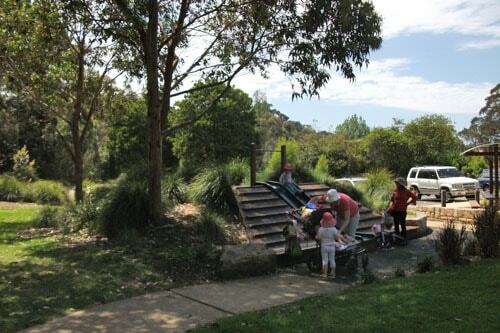 Warners Park is lovely for younger children, especially toddlers and preschoolers. Mona Street, Mona Vale; huge area of play equipment inside fence, cafe right beside playground, bike track and grassy spaces outside, beaut views. Excellent equipment for older and younger children, plus a huge oval with a bike track all around. These are the ones that are worth making a trip for, worth meeting friends at. And I would absolutely LOVE to hear your additions to this list. It’s how we mums and dads find out all our best info. Loved Bales Park when the kids were little (shame there is no coffee near by!). Another good park (note: not great!) is the one in Clanville Rd, Roseville. Great coffee and snacks near by though at Sous le Soleil! Probably only a good park for really little ones! Bike track outside fenced area for bigger ones though! Hi, this is a great one too! I am a twin Mom, toddler boys and they loved it so did the friends we met up with. We are American Expats in Sydney for 4 years and I bought your book “straight away” it really helped me get acclimated and know where to go. Thank you! Thanks so much for this and for your lovely words. There’s great scope for mums to share info, it’s what we all do when nattering in the playground! PS Grasmere is lovely, small but has lots of good stuff and so handy. When we moved permanently to Sydney with one toddler in 1998 we rented a house in waters Road so were at Grasmere a lot. Fully fenced is great! I can tell you about one playground where I constantly lose my kids (I don’t even know why I keep on going there), but you probably wouldn’t be interested. I think I’ve been to the same playground… or a few like that… mine are great at disappearing, the cheeky little monkeys. this is very cool! will have to put some ideas up for the central coast too. off to check out the rest of your blog! Yes, would be great to hear of some in the central coast… a list I could use them visiting there… we’re playground addicts. As a mum of twins, you’ll know the value of a nice high fence! Some of my fave playgrounds don’t have fences and they’re fine to visit these days… unless I have extra kids with me, in which case only a fenced one will do! This is such a great idea, Seana. I really should do this for Tassie’s North-West. Please do it for Tassie’s North-West! Then I can use your list when I come to lovely Tassie one day with my tearaways! My two picks from your list are the park at Collaroy and the one at Winereremy Bay. Both have lots of apply memories for me and my kids. Yamble Reserve in Ryde has been updated and now has a Livvi’s Place playground – one of the all inclusive playgrounds and it is all fully enclosed. A fantastic place. Thank you Kate, I will add it to my list of playgrounds to visit. Love the Livvi’s Place playgrounds, they are fantastic.